At the beginning of the year, I made a commitment to myself to get back to healthier eating: fewer breads and desserts and more vegetables. I especially wanted to get back into the habit of having a salad for lunch, but so far I just haven’t been able to do it. With the weather so cold, salads just haven’t appealed to me, even ones with hot ingredients, like Taco Salad. So I’ve been eating a lot of soups and stews and trying to get my vegetables that way. Yet I still felt I wasn’t eating enough of those green, leafy vegetables that are right at the top of the nutrient density scale. A few days ago I decided to experiment with making a soup that was both packed with nutrition yet still…edible! And though it won’t win any beauty contests, I think you’ll be amazed with how delicious this unabashedly healthy soup tastes. I start with a base of split peas and use a pressure cooker to speed things up. For sweetness I add carrot and sweet potato (I used the white-flesh kind, just to keep from muddying the green color), and for their earthiness, I include some mushrooms. Then come the greens, 2 pounds of them. I used what I had on-hand—bok choy, spinach, romaine, and some fresh collards from my garden—but feel free to use the ones that you like best. Fresh basil added at the end gives the soup a hint of a pesto flavor, and cashew butter adds richness and depth. I think you’ll find that every bite of this soup tastes different; in one spoonful you taste basil, but in the next you detect a certain sweetness, and just when you think you’ve figured it out, you notice the split peas. The color may be monochromatic, but the taste certainly isn’t! If you’re turned off by thick, green liquids or just don’t like greens at all, this probably isn’t the soup for you. But if you’re brave enough to give it a try, I think you’ll like it. It grows on you—in a good way! I had it for lunch three days this week, and I liked it better each time. And my husband took it for lunch one day and came home raving about it. When the pressure is down, use a hand blender to puree the soup. Or, blend in batches in a regular blender—be careful because this is hot and splatters easily. Add the next 6 ingredients (*and the dried basil, if you’re using it) and cook for about 30-45 minutes, until greens are completely tender. Add additional water if necessary to prevent soup from becoming too dry. Add the remaining ingredients and use your blender again to puree the greens and mushrooms until fairly smooth. Check seasoning and add salt as needed, and thin with a little water if you find it too thick. Serve with additional lemon or try it with a spoonful of plain soy yogurt stirred in. Want to see how healthy this soup is? Based on a 2000 calorie-per-day diet, it provides 41% of your calcium, 23% of iron, 167% of vitamin C, 612% of vitamin A (i.u. ), 212% vitamin B6, 50% vitamin B12, and 143% of folicin. The only thing it’s low in is sodium! Oh my goodness! I've made this soup twice in the last week because my whole family (even two 9 year olds and a three year old!) loved it so much. I did modify it a little, because I had to make such a large amount of soup for my big family. I used a whole bag (1 lb) of split peas, 2 onions, and extra garlic…no soy yogurt or cashew butter as I had none. The first time, I used a head of Romaine, a head of Bok Choy, and some Mustard Greens. I assumed that I could leave the stems on, but found that while I was mixing it with the hand mixer they got tangled in the blades, and that, while delicious, the soup had a more stringy texture than my children could handle. Thanks! this is now a weekley dish in our house!!! 612% of Vitamin A? I ws told by my Dr that A is fat soluble (along with D, E and K) and that daily consumption should not exceed 100% What can I do to cut down on the vitamin A? Don’t worry about the high vitamin A content. Vitamin A from plant sources is Beta carotene and the worst it will do to you is turn your skin orange (and that is only at even higher amounts). They vitamin A that you have to avoid comes in supplement form and is the retinol form of Vitamin A. Take too much of that internally and it is toxic. I'll bet the vitamin A calculation is actually what you'd get if your body converted all of the beta carotene to vitamin A.
Oh I sure do love my leafy greens (now if only I could have the same appreciation for split peas). I actually like the appearance of this incredibly healthy soup- dark green= pretty to me! Thanks for the hand blender update. I’m so bummed because I was just about to purchase it. 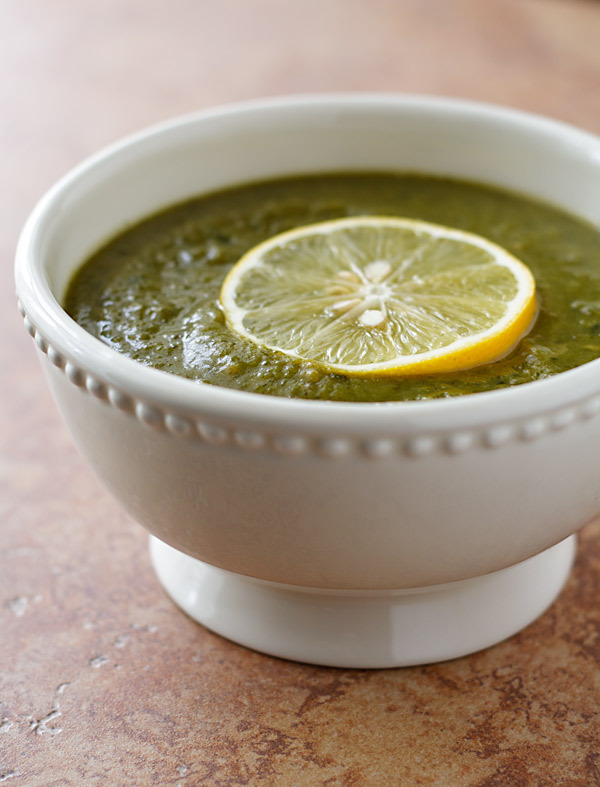 I love green split peas, carrots, sweet potatoes/yams, and kale, so this soup sounds great. What kind of mushrooms did you use? We’re not really mushroom people here so if you have an alternative suggestion, that’d be cool. I also wonder if tahini would work instead of the cashew butter. Also, is there any way to eliminate or substitute the yeast in this recipe? I’m not vegan, if that makes a difference – I just adore your recipes. Thanks! Hi Anon–I just used regular button mushrooms, but you could use any kind you want or leave them out. Or if you like celery, substute it (I was out of celery, or I would have added it, too.) Tahini should work fine–a slightly different taste, but I think it would be good. Nutritional yeast is hard to substitute for; it gives a slightly cheesy taste to food, so if you use cheese, you could try adding some parmesan right at the end. But, I’m really just guessing. Anyone else know a good sub for nutritional yeast? That sounds like a really great soup. I never thought of adding nut butter to pureed soups, but now I’m going to try it. This was just what I needed! The boyfriend and I haven’t been consistent with our blended salads lately, and although we’ve been eating almost exclusively from your website, we haven’t been eating so much of the green. I liked it very much (I’m sure the boy will like it too) but I think next time I will halve the nutritional yeast. Thanks for another great recipe. Thanks so much for the recipe, I can hardly wait to try it. I have been blending soups lately using up the stalk ends of broccoli. Now I am so excited to have another way to use nutritional yeast…slowly introducing the flavour to my family!!!! FYI — just bought that blender on Amazon, this evening, $29.99! Woo hoo! Thanks for the tip. I am really enjoying this soup. I omitted the cashew butter and mushrooms because I had neither. I think they would have added a bit more complexity and earthy tones to the flavor, but the soup is great nonetheless. Not too heavy and so healthy. I got about ten servings out of it and have it for my 3pm afternoon pre-workout snack at work. 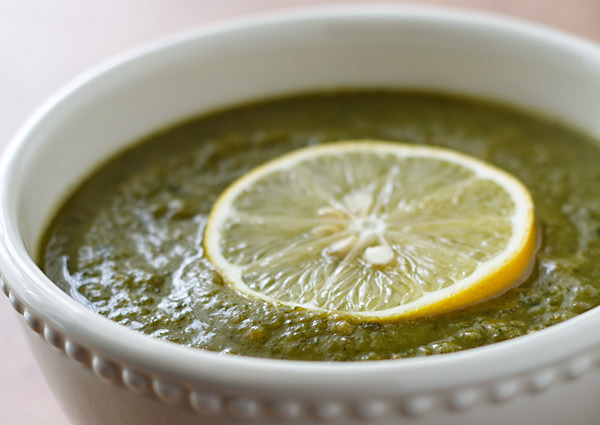 If you want to eat more greens and/or like split pea soup, definitely try this recipe! Ed, I believe that good-quality non-stick pans are not dangerous as long as you don’t overheat them or use them if the coating is flaking off (which it shouldn’t be, if the pan is of good quality). Hi Susan! Last night I made this soup (omitting the nutritional yeast and soy yogurt). It looks kinda ugly since I had to substitute pumpkin for the sweet potato I bought, but tasted pretty good – definitely better than I was expecting. It was nice to have something warm considering it was snowy and rainy. Anyways, my question is how do you reheat your pureed soups? Every time I reheat a pureed soup, I put it in a smaller pot and it bubbles uncontrollably but doesn’t actually get warm unless I put it on the lowest heat, covered, for hours. I figured you might know the answer to this since you use your hand blender a lot. Also, I’d prefer not to nuke it in the microwave, since that has been associated with killing the nutrients. Thanks! ~M, I’m afraid that for reheating soups, I always use my microwave. I’ve read that it actually preserves more nutrients than stove-top cooking. But if you don’t want to use it, you could try putting it in a double boiler. That should be gentle yet hot enough so that it doesn’t take all day. Love your soup!!! I’m eating it right now and it’s absolutely delicious! Amazingly this surprised me. I wanted to try this soup hoping I would like it but wasn’t convinced I would. The flavor is outstanding. Here are my omissions and substitutions: I substituted water for organic chicken broth, left out the yeast, & put in 1/4 tsp celery salt. This is a very different soup that I will be happy to add to my collection! This soup looks great — is there any way to cook it without a pressure cooker? For the anonymous poster who didn’t have nutritional yeast, I was out myself, so I added some soy parmesan (several good shakes, I didn’t measure) and two old rinds of real Parmesan that I had in my fridge, and I added them both right at the end with the tahini. (I ALSO didn’t have cashew butter.) I didn’t add any salt at all during the cooking process, just a little salt at the end in my personal bowl, and HOLY CRAP, MARY MOTHER OF JOSEPH. I actually moaned while eating this soup. I can’t believe it’s all so good for you and yet so yummy! Susan, you’re a genius, this is amazing stuff. I realized that my comment got posted before I completed it due to faulty Internet. I wanted to add that I retried this soup with 1 bunch of red chard, 1 of dinosaur kale, and 1 baby bok choy and included the nutritional yeast (but no yogurt). It is so much better than last time – the nutritional yeast does wonders. My fiancé and I ate it for lunch Saturday and Sunday and today poured the remainder into tupperware containers for lunch today…only I don’t know how to reheat in the microwave (stupid, I know, but I am used to the stovetop). Thanks so much for this recipe! It does really grow on you and I love how nutritious it is! ~M, to reheat it, I would just microwave it in a bowl for about a minute, stir, and keep microwaving it in 30-second intervals until it’s as hot as you want it. Stirring between each microwaving will make it heat more evenly. So glad to hear how much you’re enjoying it! I’m sorry to comment now as I realize this was posted awhile ago but I was just wondering if you think an overripe plantain would be a good substitute for the sweet potato in this soup? I have all the other ingredients otherwise. Thanks alot. Ilana, I have so little experience with plantains that I just don’t know. I could hazard a guess that it should work, but I’m not certain. Wish I had a better answer. Good luck! Oh my goodness! I’ve made this soup twice in the last week because my whole family (even two 9 year olds and a three year old!) loved it so much. I did modify it a little, because I had to make such a large amount of soup for my big family. I used a whole bag (1 lb) of split peas, 2 onions, and extra garlic…no soy yogurt or cashew butter as I had none. I’ll bet the vitamin A calculation is actually what you’d get if your body converted all of the beta carotene to vitamin A.
I have to share this – Recently I made this soup and everyone, save my youngest (10) loved it. The youngster took one look at it and said “It looks like baby barf soup!” As a mother I cringed – because he had a point. But the oldest (16) said “So what, it tastes great.” I know we’ll have it again, because it does taste great, probably when the youngster is away at camp or a friend’s house. Meanwhile our family has an unofficial name for the soup. LOL! Sue, that’s the funniest name for this soup yet. Thanks for sharing! I’ve never made this soup as written, but I DO use the seasonings in the green soup I make when my farm delivery gives me too many greens. I start with a few red or fingerling potatoes, then add whatever greens they gave me (spinach, kale, beet greens, geen beans, etc). I then use the nut. yeast, cashew butter and basil as written in the recipe. It always turns out GREAT. Something about the combo of the cashews and nut. yeast just makes it taste so rich and savory. Thanks! Loved this! Things I changed: veggie broth instead of water, almond butter cause I didn’t have cashew, and lots more lemon juice. My greens were spinach. DELICIOUS! I am already making another pot cause my family ate the first one so fast. Thanks! I don’t have a pressure cooker. Can this recipe be adapted to stove top or crock pot? It looks yummy. Thanks. Sharon, the stove top directions are in the recipe, but I’ve never tried it in a crock pot. It should work. You could always be the one to test it for me! This looks perfect. I have a ton of greens in the fridge that I had plans for. Being pregnant, cooking isnt turning out quite how I usually plan. Im soo nauseated, that the only thing that I can keep down is soup most of the time. This looks like quite possibly the most nutritious soup I can make, especially because its high in folicin and iron. No pressure cooker, but I assume I can just put it in a soup pot for a longer period of time till its cooked. Its also another excuse to use the VITAMIX! I heart my vitamix. SusanV This sounds amazing! I think I’m going to try it raw, so I’ll have to make a few adjustments. The ingredients are easy enough to puree raw along with the greens, I’ll probably have to omit the split peas, but everything else looks good to go! Once I get it puree’d I can put it into the dehydrator to warm it up! I’ll let you know how it goes. Thank you for inspiring me once again! Susan, This recipe sounds amazing! Can’t wait to try it! I love pea soup and I love this type of blended, high-nutrient soup, so I am so excited to have a new recipe to try! 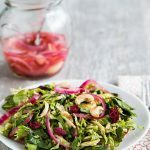 I could totally relate to your comment about wanting to eat more salads but going with the soups since it is cold out:) That has totally been my experience the past few weeks, as well! 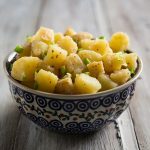 This recipe sounds amazing and I can’t wait to try it! I love pea soup and I love this type of blended, high-nutrient soup, so I am so excited to have a new recipe to try. How is there B12 in this? That doesn’t seem correct… Looks good though, can’t believe I never tried it out! Sara, the nutritional yeast is full of B-12. Some people use it just for the B-12, but I use it for the taste. Wow! I saw this come up on Facebook as a repost during the last week or so. Tonight I was inspired to make it, albeit adapted to suit the greens and other items I had on hand. In went a bok choy and carrot tops (the real reasons for making this – before either went bad), part of a green pepper I used earlier in the week, winter squash in place of the sweet potato and carrots, some items from the freezer I want to use up, a big handful of parsley, fresh thyme from my garden – you get the idea. I mostly used the same herb profile (marjoram instead of oregano, but I understand that they’re botanical relatives), added another cup or two during cooking, upped the nooch, but I KNOW I’ll be coming back to this one again! Thank you for the inspiration, as always! 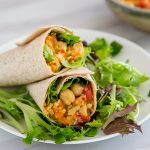 Is there an alternative to using the split peas? This soup sounds delicious, but I’m not a big fan of split peas. I suppose you could use a different type of legume, but the cooking time will be very different. I just made this for the second time and have a recommendation to give to anyone who wants to try this recipe: Leave it unblended! The first time I made this I LOVED it (see my previous comment in 2010) and I left it unblended. This time I decided to try blending it as I have an immersion blender now and thought the soup was merely ho-hum. I find the flavors are better when the ingredients are left separate. It also makes you feel fuller when you have to do some of the chewing yourself, and I liked being able to see all the goodness that I was eating in all its forms and colors instead of just smooth green. Also, when you leave it unblended it needs far less cooking otherwise it becomes too mushy, so leaving it unblended makes for a quicker recipe too! I was wondering if one could use frozen cooked spinach etc. for the 2 pounds of chopped greens? I figure it could cut down on the preparation and cooking time. What do you think? Can’t wait to try this recipe! I’m sure that would be fine. I often use frozen collards myself. WOW! I can’t believe this tastes so good! And super healthy. A great way to eat lots of greens. I used frozen collards and fresh spinach. I will be making this again, thanks for the great recipe! I LOVE your site. Hi, thanks for all the amazing tips and recipes! Really excited to try this one! When you reference the oregano and thyme, did you use fresh or dried? I have home grown dried oregano that is much stronger than the store bought product, and wondered if I used that, how would I alter the quantity? Thanks again! I use dried, both store-bought, so if I were you, I’d just start with about half of what I call for and then add more to taste. Hope you enjoy it! Susan, I’ve been hooked on your blog since I became vegan 5 1/2 years ago. 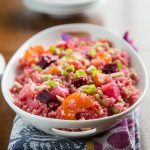 It was the first one I stumbled across when relearning how to eat (I’m of the Eat to Live clan), and your blog is by far my favorite still. Your recipes are creative and healthy and your narratives well-written and fun. Fatfree Vegan Kitchen is my most-used cookbook that never existed. Whenever I’m feeling a little culinarily lost or in need of a healthy boost, I come here. That’s how I came across this recipe. It didn’t appeal to me when you posted it (evolving tastes, blah blah blah), but yesterday I was looking for a replacement for my morning green smoothie. I’m trying to watch my sugar intake, and found that my smoothie wasn’t as calorically dense as I’d fantasized it was. So I made this soup last night, using kale and collards and substituting sunbutter for cashew butter (it was on hand) and omitting the basil (my plant is infested!). I had a spoonful last night and thought it was good, but the bowl I had for breakfast was hands down amazing. It was not only delicious (tasting somehow like broccoli) but also filled me up well into the afternoon and gave me enough energy to pump through my gym routine. 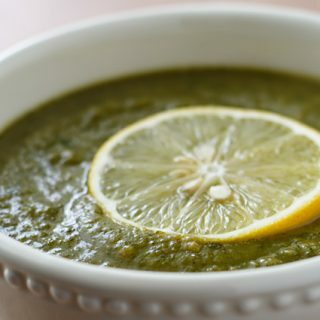 The long of it is that your Green on Green Soup has become my new, healthier green smoothie, and because it’s been a while since I expressed my gratitude for this blog and the effort you put into it, I thought I’d just let you know how you continue to help me stay on a healthy path, even 5 1/2 years later. Thanks 🙂 Keep on keepin’ on! Wish I could make this. Don’t have and can’t afford a pressure cooker and super blender, which is a big problem with this whole way of eating. Totally believe in it but it is elitist in so many ways. There are instructions for regular stovetop cooking, and I made this using an ordinary (cheap) blender. There’s nothing elitist about this recipe or way of eating. It’s all what you bring to it. So many times I wind up back at your recipes. Just made the greens on green soup. Subbed miso for nut butter and it was wonderful. Very satisfying as we go through a polar vortex. Thank you again. Consistently the best bood blog. Can’t wait to try it. I’m doing the green cleanse at the moment so will omit the carrots, sweet potatoes and mushrooms, which I’m sure will make it not quite as good, but can’t wait to try the full recipe. No make a big batch of soup and freeze portions to take to work for lunch so I’m always on the lookout for new recipes. Love your blog.